Flexi-tube is the standard tubing used in all of our Sky Tunnel Skylights, Sola Skylights, Lightwell Skylights & Direct Skylights kits. It suits most applications up to 3m in length. Installation of Flexi-tube is very easy, and the performance is outstanding. Flexibility allows the installation of the Roof Parts and Ceiling Parts to be off centre, so avoiding any obstructions in the attic space is simple. 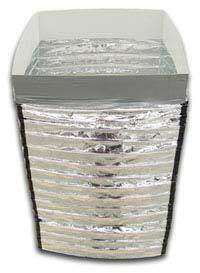 Providing up to 86% reflectivity, SG Eco’s Flexi-tube™ is a cost effective and reliable component in any skylight kit. We currently offer 41 different diameters ranging from 150mm to 1267mm. 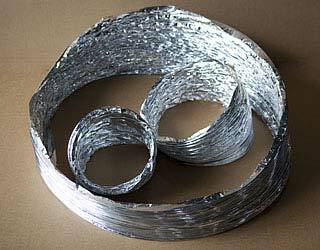 Many of the larger sizes are used for creating square or rectangular tubing. Our round Flexi-tube™ is supplied in 1.5m to 10m lengths, where as the square and rectangular are supplied in lengths up to a maximum of 3m. Sizing of the square and rectangular range from 350mm × 350mm up to 995mm × 995mm. If we don’t have the size you are looking for, custom sizing is available, depending on the size and quantity required. The square and rectangular Flexi-tube™ can have an additional layer of tape added to the corners to add durability and strength. 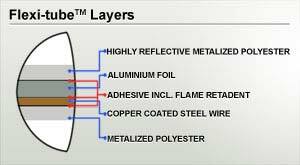 Our Flexi-tube comprises two layers of metalized polyester, a layer of alumium foil, 1.2mm copper coated steel, all held together with a flame retardent adhesive manufactured in Australia. With the Flexi-tube™ being manufactured in house, from the highest quality local and imported materials, you can be sure our Flexi-tube will stand the test of time. Afterall, it already has for 20 years!